Women’s Doubles gold in partnership with elder sister Melanie, add Daniely Rios to the family duo and it was the top prize in the Women’s Team event, sandwiched in between Mixed Doubles success was the order of proceedings in harness with Brian Afanandor. 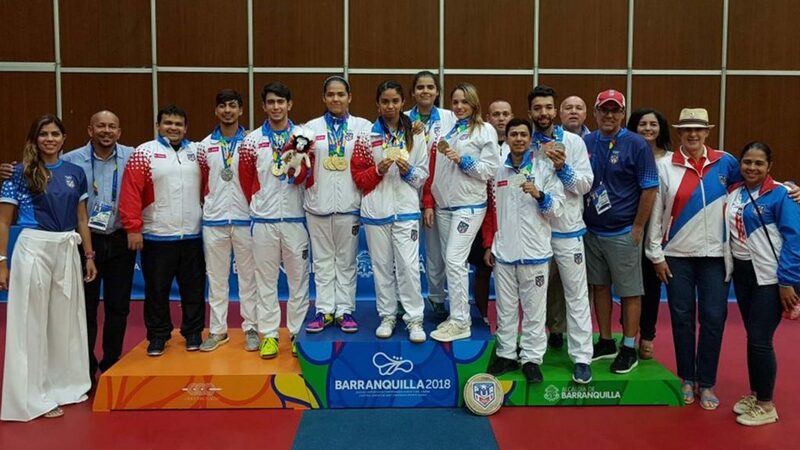 On Tuesday 24th July, Adriana Diaz completed a clean sweep of titles as Puerto Rico emerged the most successful of all in the table tennis events at the XXIII Central American and Caribbean Games. On the final day of play, she maintained her perfect record to win the Women’s Singles title. However, the success was not without some tense moments for her supporters; the latter stages proved an exacting task. Safely through to the quarter-finals thanks to her previous day’s efforts; the top seed, Adriana Diaz was extended the full seven games distance by Cuba’s spirited Lisi Castillo (11-7, 7-11, 8-11, 11-7, 11-7, 11-9, 9-11, 11-7), before in the penultimate round experiencing an even more severe test when confronting Mexico’s Yadira Silva, the no.7 seed and defending champion. Adriana Diaz, as she did when beating Amy Wang of the United States in the final of the Girls’ Singles event at the Pan American Junior Championships in the Dominican Republic earlier in the month, emerging successful by the very minimal two point margin in the deciding game, repeated the feat against Yadira Silva. She succeeded in a quite titanic struggle, recovering from a three games to two deficit to secure victory (12-10, 9-11, 11-8, 9-11, 4-11, 11-5, 14-12). A place in the final booked, life was only less fraught for the loyal Puerto Rican supporters; Adriana Diaz succeeded but she needed six games to beat the host nation’s Paula Medina, the no.2 seed (11-5, 11-4, 11-9, 7-11, 8-11, 14-12). Earlier in the opposite half of the draw, in the later stages Paula Medina had beaten Melanie Diaz, the no.6 seed, in a closely contested seven games encounter (11-7, 7-11, 11-7, 8-11, 11-9, 9-11, 11-5), prior to reserving her place in the final courtesy of success in opposition to Cuba’s Idaly Lovet, the no.8 seed (7-11, 11-6, 11-9, 11-7, 11-9). Overall, Puerto Rico, who secured at least one medal in every event, ended matters with eight medals (four gold, two silver, two bronze), mission accomplished.